The 87th annual Sam Houston State University Tree of Light ceremony was held Tuesday in the university’s recently completed new mall area. According to Student Activities assistant director Angie Burns, approximately 500 students from several university organizations attend the tree-lighting event every year. 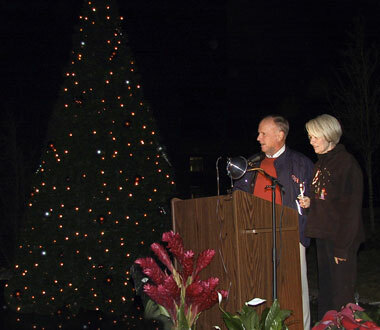 “The Tree of Light ceremony is the university’s oldest, most cherished tradition,” Burns said. “It’s also a time for giving, because we collect canned donations for the Good Shepherd Mission during the event. For the first time since the tradition started in 1921, the tree will be located in the new mall area. “We’ve added four feet to the tree this year,” Burns said. “The tree really showcases the new mall area — it’s a wide open setting that’s very natural for a 26-foot tree. SHSU president Jim Gaertner spoke at the event, and both the Orange Pride Dance Team and the university choir gave short performances. Burns said the Student Activities office encouraged students and organizations to decorate the tree both before and during the ceremony. “Students and organizations placed ornaments on the tree, and then we had wassail, hot chocolate and cookies available,” Burns said. Student Activities organized an exhibit in the Lowman Student Center Art Gallery which features the history of the ceremony. Gallery visitors will also have the chance to view a slideshow of the tree assembly, a feature of the exhibit which will be on display through Nov. 30. For more information about the exhibit, call Student Activities at 936.294.3861.